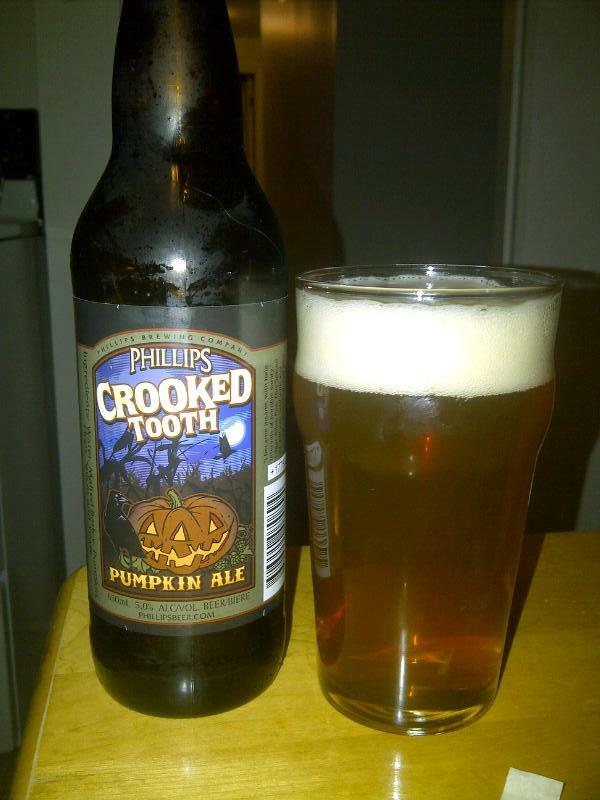 From Phillips Brewing out of Victoria BC comes the “Crooked Tooth Pumpkin Ale”. This seems to be the year of the pumpkin beer for sure with more and more coming out every day! The beer pours an orange colour with a big white head. The smell is dominated with pumpking with undertones of spices and malts. The taste is of sweet pumpkin with lots of spices and nutmeg. The beer has an alcohol content of 5%. This beer has a very nice flavor but I would not rate it at the top of my pumpkin beer list. This entry was posted in Ale, Pumpkin Beer and tagged ale, bc. canada, beer, malts, nutmeg, phillips, pumpkin, pumpkin ale, spices, sweet, victoria.